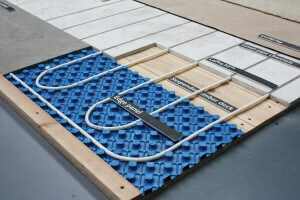 Nu-Heat has produced a one day ‘Introduction To Underfloor Heating’ training course suitable for plumbers, heating engineers and professional installers new to UFH. The course content comprises both the theoretical and practical aspects of warm water underfloor heating and its application in new builds or as part of renovation projects. On completion of the course you will be able to assess whether or not a project is suitable for UFH, understand system variations and options for system set up, appreciate the range of options and implications of floor construction choice and system control and understand what is involved in planning an effective installation programme. From a practical aspect the course provides hands on experience of installing Nu-Heat’s ClippaPlate floor construction for suspended floors and LoPro10, our low profile, retrofit solution. The course has been designed to provide an understanding of what Nu-Heat can do for you from UFH designs, calculations, drawings and manuals through to user guides for end users and to showcase the benefits of installing a fully designed and guaranteed UFH system from a single supplier. All training materials and lunch are included.